The EIA published it’s first “Drilling Productivity Report” for six major producing regions in the U.S. earlier in the week. The EIA found the Eagle Ford and the Bakken account for approximately 75% of oil production growth in the U.S. each month. The average rig drilling in the area adds ~400 b/d of oil production each month and just over 1 mmcfd. The EIA also shows the play is producing more than 1 million b/d of oil (likely includes more than just Eagle Ford "oil" production). Quick observation - I didn't read through the complete methodology, but I assume the EIA is looking at the entire area and making estimates for Eagle Ford production. They are the first to show "oil" production from the play at more than 1 million b/d. My guess is the number includes condensate and possibly other liquids. 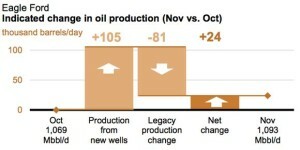 Also, I find it interesting the group has the ability to predict the average Eagle Ford rig added 396 b/d in October and will add 404 b/d in November. The state is just now beginning to report August production figures.